Speziell für unsere deutschen Gästen haben wir maßgeschneiderte Radtouren im Angebot. The first renter mentioned will be the contracting person for correspondence, payments and refunds. Height (in inches or in centimeters) is required to appoint the correct bicycle and frame size. Email address is required to enable us to send you a copy of this booking form. Please do not use an email address with a highly sensitive SPAM blocker, our (valid) email might be mistaken for SPAM, and therefore bounced. Your email address will never be sold or passed on to third parties. Equipment delivery between 8 and 11 a.m.
On request, and if possible, delivery on the evening before. Taxi transfer from Amsterdam airport Schiphol or ferry port. Taxi transfer to Amsterdam airport Schiphol or ferry port. 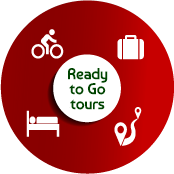 Do you want Tulip Cycling to book extra nights? instructions for the safe transfer of your credit card details. - into our Euro bank account. Tulip Cycling adheres to the credit card payments securing policy. Bookings for groups till 6 persons require a deposit of Euro 100. Bookings for larger groups require a deposit of 10% of the total costs as given on your invoice. The balance of the trip cost is due 60 days prior to the departure date. Trip invoices will be sent to the first participant indicated and can only be paid in full. a) Tulip Cycling: A bicycle rent and bicycle travel arrangements company established in Wijhe, The Netherlands. Chamber of Commerce, Zwolle, The Netherlands no. 50915371.
b) Country name: Where the expressions Dutch or Holland are used this is synonymous to The Netherlands. c) Renter: Person or persons, mentioned in the rental contract, who is/are renting bicycling equipment and support from Tulip Cycling. d) Lessor: Tulip Cycling Company. e) Rental material/equipment: All articles, rented or loaned from Tulip Cycling, itemized in the reservation form and notification of receipt, including all materials submitted to the renter, such as but not exclusively, the free accessories. f) Booking / Reservation form: Form on which the renter is required to fill in identities and desired quantity of the rental equipment and support items. g) Rental contract; Agreement between renter and lessor according to the tour confirmation form and tour invoice. h) Tour confirmation form: Form with which the lessor confirms the booking of the cycling tour by the renter. The corresponding equipment and support for this tour is specified on the tour invoice, addressed to the renter. i) Tour invoice: Form on which the lessor specifies the rental equipment and support items with the corresponding prices and the total amount. The total amount does not always include accommodation costs. j) Notification of receipt: Form which the renter is obligated to sign on receipt of the rented and loaned equipment. k) Rental period: Time between delivery of the rental equipment to the renter and return of the rental equipment to Tulip Cycling. l) Currency: The amounts mentioned in these Terms and Conditions are in the Euro currency. a) The rental material may only be used by the designated renter and the members of his party as mentioned in the rental contract/notification of receipt. b) Itineraries and other parts of a support package remain the property of Tulip Cycling. c) The use of the GPS device is strictly prohibited for persons under 15 years of age. d) The rented bicycles may never be handed over to, or used by any persons, others then those mentioned in the rental contract. e) It is explicitly prohibited for the renter to rent out the rented bicycles to a third party. f) Renter is considered to take good care of the rented materials and to protect it, within reason, from damage, loss or theft. Added to article 2a, rental materials may only be used in accordance with its normal use and category. Only one person per bicycle. g) Tulip Cycling will deliver the rental material in a proper condition. If, in spite of that, any repairs during the rental period are necessary this can be done by a local bicycle-repairer. The renter must, in case of more than wear-and-tear damage, consult Tulip Cycling before handing over the bicycle to the repairer. At the end of the rental period a Tulip Cycling representative will determine whether the material failure was more than regular wear-and-tear. If so, the repair expenses must be paid by the renter or will be subject to the equipment insurance conditions. h) In case of unpredictable circumstances, Tulip Cycling will offer substitute brands of equipment. This material will be of equal quality and will meet the specifications of the contracted equipment. a) Rental equipment delivery will be between 8 and 11 a.m. on the first day of the rental period. The rental equipment will be delivered to the renter at the Tulip Cycling headquarters or any other pre-arranged meeting point. b) Delivery of the rental equipment can, on the renter's request, take place on the evening before the first tour day. This service is free of charge and the decision to meet with this request will be made by Tulip Cycling exclusively. c) Return of the equipment on the last tour day must be before 6 p.m. at the Tulip Cycling headquarters or any other pre-arranged meeting point in. a) The contract is realized after the booking form is accepted by the lessor. The lessor will notify the renter of his acceptance by email. The written tour confirmation will state the names of the persons in the contract, the rental period and the reservation requests. The accompanying invoice will state the number and specifications of the rented equipment and the related prices. b) The rental contract will be automatically dissolved, without serving any prior notice on the renter, if payment of the deposit payment is not received within 20 days from the payment date as indicated on the invoice. The dissolution of the contract does not in any way relieve the renter of his obligations, especially payment of the rent and deposit, forthcoming from the contract and the cancellation terms. c) Changes and modifications in the initial booking will be subject to an administration fee of Euro 25. Requests for changes made within 30 days of the start of the tour are also dependent on equipment and accommodation availability. All changes in the initial booking will be confirmed by email or regular mail. d) At the tour start and tour finish the renter must sign a notification of receipt and return. This notification states the number and specifications of the rented equipment and support, rental period, date of delivery and date of return. e) The first renter mentioned on the reservation form must be over 16 years of age and will be the contracting person for payments, refunds and communication. f) The first renter's signature on the notification of receipt and return is valid for all the items on the notifications. a) Bookings for groups till 6 persons made more than 60 days prior to the departure date require a deposit of Euro 100. Bookings for larger groups require a deposit of 10% of the total invoice with a minimum of Euro 100. This initial payment is part of the total invoice. Bookings within 60 days prior to the departure date need to be paid in full. b) Prices are stated in Euro. c) All taxes are included in the stated prices. d) The rental contract is subjected to the cancellation policy stated under article 8.
a) Renter is subject to Dutch. Belgium and German Traffic Laws. In particular, renter acknowledges that there is no bicycle-helmet obligation under this law (In Germany a helmet is obligated on a road bike or mountain bike as also for children). b) Besides the pre-tour traffic rules instruction and briefing by Tulip Cycling, it is the responsibility of the renter and his party to be sufficiently informed about Dutch, Belgium and German Traffic Laws and regulations. c) It is the renter's own responsibility to have sufficient insurance coverage against all claims that might arise from legal responsibility of the renter and his party such as responsibility for (non-equipment) damages, injuries, legal procedures and tort. d) Tulip Cycling can only be held responsible for direct damages or injuries that are a result of material failure. The responsibility is limited to failure that is a result of insufficient normal day-use maintenance by the lessor. For all other damages of goods and injuries of the renter, his party or a third party during the rental period, Tulip Cycling cannot be held responsible nor can this derive any right to cancel (a part of) the rental contract. e) The contract is submitted to Dutch Law and will be carried out under Dutch jurisdiction. f) Disagreements and claims between both renter and lessor as well with a third party must be heard by a Dutch court in Arnhem or Zwolle. a) The insured: Renter of Tulip Cycling equipment, as described on the booking form. b) Insured articles: All Tulip Cycling equipment that has been rented and is used during a Tulip Cycling tour, as described on the booking form. c) Coverage: Theft, damage or fire arising from any calamity, caused by internal or external sources. d) Area: the insurance is valid within The Netherlands, Belgium and Germany. e) Insurance-premium amounts to Euro 1 (one Euro) per person per day (minimum Euro 10). This is for one adult bicycle. If a E-bike, tandem or road bike is rented the insurance premium amounts to Euro 2 per person per day (minimum Euro 20). One child bike, if rented, is included. f) Own risk / deductible: The first Euro 45 per renter per insured event will be paid by the insured (renter). g) Damage: Renter must always immediately report a theft, loss or damage by accident to Tulip Cycling and the local police. A referred police report and specified repair invoice must be handed over to Tulip Cycling at the end of the rental period. h) Restrictions: Renter is obligated to lock the bicycle(s) securely when left unattended. In case of loss or theft the renter must at all times be able to provide a police report describing the particular loss or theft, and the keys to the lock which were originally given to the renter at the start of the tour. If renter cannot provide those items, he will be held responsible for the combined loss and damages resulting from the theft or loss of the insured items: adult bike Euro 1100, tandem and road bike Euro 1650, E bike Euro 2500, child's bike/child trailer Euro 350, pair of panniers Euro 100, handlebar bag Euro 50, luggage trailer Euro 250, GPS device Euro 200, helmet Euro 40, poncho Euro 25, car trailer Euro 1500, free rental accessories Euro 20.
i) Damage- and loss exclusions: Non-designated use, criminal intent, negligence, molestation by war or large-scale riots, nuclear disasters..
b) At all times Tulip Cycling shall refund the total invoice costs in case of natural disaster, large-scale riots or evacuations in the area of the cycle-routes. c) Tulip Cycling is not responsible for any late arrival due to travel delays, flight cancellation or illness. d) There is no refund for shortening of the rental period, except for reasons mentioned in article 8b. e) Changes and modifications in the initial booking will be subject to an administration fee of Euro 25. We will check availability and will confirm your booking as soon as possible. The support given by Tulip Cycling was excellent. The equipment, choice of bike paths and the pre-programmed GPS made the whole experience one of pure delight and fun with gorgeous sights all the way, wonderful accommodations and easy travel. A wonderful trip!!! Thanks to Peter for all his help to make it so special (and for convincing me to do the trip without a tour group). We had such a great time. My two 10 year old girls had such a great fun (and were proud of their accomplishment). It is a of a trip we will all remember. Thanks for everything! I’ve already recommended you to friends. Just returned from our fabulous journey from Amsterdam to Bruges. It was outstanding! The itinerary, the equipment (bikes, GPS, maps, etc.) and our guide Peter were fantastic. Peter really have deep knowledge of his country, what a memorable ride across the Netherlands. Thank you for everything. We packed lots of memories into this trip. It was a grand way to learn about Netherlands and see what a cultured and friendly place it is. The GPS was essential, and we are so glad we learned to use it. Everytime, we wondered where is Peter taking us? We would come across a canal, field of flowers, quaint village, spectacular scenery. Thank you so much. You run a very professional organization and we look forward to more tours in the future. You have made us biking enthusiasts. Because of you we had a magnificient trip! I’m excited to tell all my friends about my trip and this lovely country and encourage them to come and visit and use Tulip Cycling to see the country. I thought I would just let you know we are having such a GREAT TIME!! Maybe you can find a job for a orthodontist and a Radiologist for us.? Thank you so much for this very enjoyable experience! Your organizational skills and attention to detail are outstanding. My wife and I just finished a 4 day self guided tour. It was fabulous! Tulip planned a route that we never could have found on our own. The equipment and handling of our luggage made everything easy. We loved the trip!! Thank you Tulip Cycling for a exciting and scenic 5 day tour through part of your beautiful country. Peter’s meticulous organisation and first class equipment made our ride a memorable one. Our friends recommended this cycling trip for my 50th birthday and it was a fabulous celebration-- by far the best family vacation we’ve ever taken! The route Peter crafted for us was perfect-- so beautiful! The hotels were quaint, food was delicious. And our 11 and 12 year old loved riding tandem. I cried when we had to go home. We’ve talked about this trip for months... can’t wait to return. A 5-star experience! The trip overall was our favorite vacation we've ever taken. We feel privileged to have visited. As a lifelong cyclist, it was like visiting the promised land. Thank you for organizing our trip this summer, we had a fantastic time and will definitely return in the future. We had so many good experiences traveling along the countryside enjoying the scenery and weather. We had a great time in Holland. Our memories are still fresh in our minds and we loved every minute of out time in the Netherlands. Your company ensured the cycling portion was flawless and most enjoyable. Thank you for providing top quality bicycles and support equipment. The tour was wonderful, and I've recommended your services highly to my friends. In particular, the route selection was superb. We had the most wonderful holiday with your company and I wish to say a big thank you for all your hard work and professionalism in ensuring we had the best possible experience. Tulip Cycling just got better! We do a weeks self guided tour with Tulip Cycling every year and have now been cycling for 9 years each time in a different area of this lovely country. Our trip with you was fantastic....and we've told many others about it. The GPS made it unique. 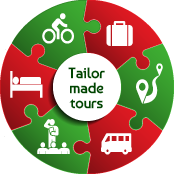 We have recommended your business to many people – as we had a terrific cycling trip, due to your professional organisation and fabulous path routing. The GPS was brilliant and the route really showcased the variety of experiences available in the Netherlands – there is no better way to see a country than through the eyes of a local. It was truly an extraordinary journey, where everything was carefully prepared by you and your staff. We were enchanted by the landscapes of flower fields, windmills, canals, small towns and by the kindness with which we were treated by the Dutch people. It was really unforgettable days that make us want to return, and invite our friends as well. Tailor made tour for 3 days of cycling for my husband, me and teenage son! Fantastic bikes, superb organization!!! A fantastic get away and we just had to show up. Lots of opportunity to add in our own stops along the way, the route details, booked hotels and luggage transport made for a stress free journey. Peter is outstanding and lives what he does. Every detail taken care of do you can just get on the bike pedal away with your GPS route! We did a six day ride in June to mark my 70th birthday. The accommodations were amazing; small, neat, clean hotels and bed and breakfasts. The GPS was a little iffy for us, but Peter always answered our call for a quick fix! I would love to come back and do another ride. Yes, one can DIY a bike trip around the country, but we believe that the depth of knowledge that Tulip provided for our ride took us to and through places that we would not otherwise have experienced just following a map or Google Maps over 16 days. We believe Tulip provided very good value and we recommend them highly. We asked Peter to plan a ride on our tandem from Amsterdam to Ghent, Belgium in 8 days in September 2018. He planned the route, with beautiful maps and excellent GPS, arranged the hotels and the luggage transport. We even go to almost see the King in The Hague. Only thing he couldn't control was the weather, when a storm blew in from the North Sea. We got a bit wet and wind-blown, but thoroughly enjoyed all of his arrangements. We did the short version of the historic town. It was perfect for us as an American family of four with two teenage kids (13 and 16). If we ever get another chance, we would do it again and probably build in more days to the trip to just enjoy the different towns. My husband and I did a 1-week tour through parts of the Netherlands in May 2018 and we loved our experience. Peter and Tulip Cycling were amazing! The level of detail and organization is spectacular! Communication with Peter is easy and quick. Our experience was so good that we are returning again next year with a large group! I highly recommend this tour company - you will be very pleased with the service! We were very happy with your cycling service. The e-bikes and GPS were an excellent choice for us as was your instruction at the outset. The Hanseatic tour was very interesting and the countryside beautiful. We particularly noticed how friendly and helpful the people in Holland are. We also noticed a more positive attitude about cyclists by motorists in Holland compared to motorists in Canada. Tulip Cycling, established at Boerhaar 37, 8131 SV Wijhe, The Netherlands, is responsible for the processing of personal data as detailed in this privacy statement. Our website and/or service does not process data about website visitors who are younger than 16 years. Tulip Cycling does not make decisions based on automated processing on matters that can have (significant) consequences for people. This concerns decisions taken by computer programmes or systems, without involving a person (for example, an employee of Tulip Cycling). Tulip Cycling does not store your personal data longer than is strictly necessary to achieve the purposes for which your data is collected. We store your personal data for 7 years in connection with the tax legislation. Tulip Cycling exclusively provides information to third parties if this is necessary for the execution of our agreement with you or to comply with a legal obligation. Tulip Cycling only uses technical, functional cookies and analytical cookies that do not infringe your privacy. A cookie is a small text file that is stored on your computer, tablet or smartphone when you first visit this website. The cookies we use are necessary for the technical operation of the website and your ease of use. They ensure that the website works properly and remember, for example, your preferred settings. We can also use them to optimise our website. You have the right to view, correct or delete your personal data. In addition, you have the right to withdraw your consent to the data processing or to object to the processing of your personal data by Tulip Cycling and you have the right to data portability. This means that you can submit a request to us to send the personal data that we have available about you in a computer file to you or another organisation mentioned by you. You can send a request for access, correction, deletion, data transfer of your personal data or a request for cancellation of your consent or objection to the processing of your personal data to info@tulipcycling.com. Tulip Cycling takes the protection of your data seriously and takes appropriate measures to prevent misuse, loss, unauthorised access, unwanted disclosure and unauthorised modification. If you have the impression that your data is not secure or there are indications of abuse, please contact us at info@tulipcycling.com.